New products helped increase the number of A3 color multifunctional peripherals (MFPs) sold year on year. Although the market for A3 monochrome MFPs continues to mature and the number of units sold in major markets such as Europe decreased, total sales of A3 MFPs surpassed that of the previous fiscal year. In OPS (a service to provide an optimized print environment to the customer), which is a focus for growth in the field, structural preparations to strengthen our proposal and service provision capabilities for global projects were a success, and sales increased 44% year on year to ¥29.3 billion. We also acquired 16 new GMAs including the largest financial group in Central and Eastern Europe, Erste Group Bank AG (HO: Austria) and a major European energy company, resulting in total sales of ¥14.9 billion - a 35% increase year on year. In order to strengthen the IT service and solution proposal capabilities that are core to executing the business process improvement services we are promoting along with OPS, we acquired the IT service provider Serians S.A.S. (HO: France) in June 2012 and Raber+Märcker GmbH (HO: Germany) in December the same year. This increased our capability to propose business process improvements to small- to mid-sized companies. With a further five similar M&As in the United States, efforts to transform existing business operations made major progress. Sales for IT services and solutions for the fiscal year grew 78% year on year to ¥42.4 billion, partly as a result of these M&As. 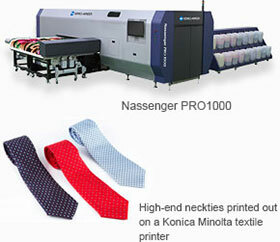 Sales of color equipment in the United States and Japan increased despite a challenging market environment. 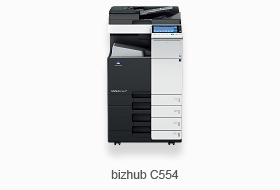 The bizhub PRO 951, bizhub PRESS 1250, and bizhub PRESS 1052 - the new monochrome equipment launched in the second half - were a success, resulting in sales of color and monochrome equipment both exceeding the previous fiscal year and securing almost double-digitgrowth. Also, our sales alliance with Komori Corporation resulted in the achievement of our initial aim of enhancing our sales capacity for major commercial printing customers and extending our reach to large companies in North America, which contributed to an increase in the number of high-end units installed. To strengthen our sales, service, and solution proposal capabilities in the in-house printing market, we acquired the leading company in on-demand output services in Japan, FedEx Kinko's Japan Co., Ltd., in May 2012 and FedEx Kinko's Korea Ltd. in January 2013. 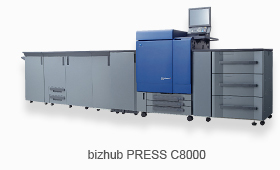 In Europe, we acquired the major print management service company Charterhouse PM Limited (HO: U.K.) which, in addition to having extensive resources relating to the production of printed material for customers, specializes in cost optimization and marketing planning and has a record of business development in 18 countries in the region. Through these M&As, we have strengthened our capability to make proposals to major companies and avenues for central reproduction department (CRD) projects are steadily increasing with large projects from major companies in Japan having already been ordered. In the industrial inkjet printer field, which holds good prospects for future growth, a structure for full-scale sales promotion of high-end models from FY March 2014 has been prepared in the domain of inkjet printers for textile POD, in which we lead the market. In addition to inkjet textile printers enabling the production of multiple models and small lots, are receiving attention for facilitating a drastic reduction in environmental impact. We aim to expand this domain in order to make it a new pillar of growth. We are also jointly developing digital inkjet machines with Komori Corporation, with the goal of expanding into the commercial printing market. We are currently conducting joint development of a next-generation, high-speed inkjet digital press that combines Konica Minolta’s inkjet technology with Komori Corporation’s paper handling technology. This product will target the commercial printing market, where digitalization is expected to drive further business expansion. As a result, sales in the Business Technologies Business for the fiscal year were ¥581.6 billion (YoY +6.2%) and operating income was ¥31.6 billion (YoY -19.8%). The sales expansion of new color multifunctional peripherals and production print units contributed along with the effect of M&As, resulting in a year on year increase in sales. The overall decrease in operating income was due to the effect of delays in cost reduction planning for new products and worsening market conditions in Europe.